Comedian, podcaster, and (now) television star(?) Marc Maron tweeted me back today! Yeah! I generally find twitter to be sort of stupid. Actually, I still do. But every once in a while, something happens that keeps me active on the site. Marc Maron's new IFC series, Maron, premiers tonight, and his new book was released earlier this week. Naturally, he has been making the publicity rounds to promote them. He was on Howard Stern a few days ago, he called in to Todd N Tyler (a local morning show) the other day. I missed him on Fallon and some others. So, I used my Cox Cable app on my phone to set my DVR to record the Maron premier tonight. First time it ever worked! 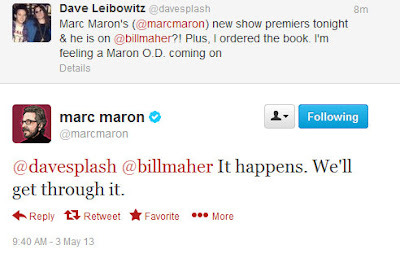 However, a search for "Maron" also tagged his appearance tonight on Real Time with Bill Maher tonight. I always watch Maher anyway, so this will be a nice bonus. I excitedly tweeted about how much Maron I was getting this week, and the man himself responded! It was hardly a dissertation or anything, but I am excited anyway.